Recently, Magic Box Music confirmed on their website that they were working on the trailer music for both of the Deathly Hallows movies. 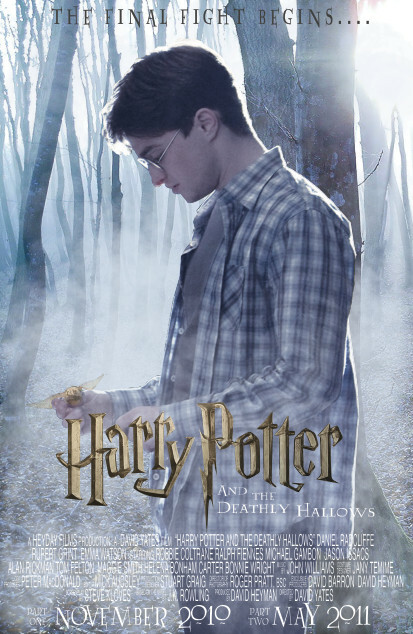 Next to the post, this movie poster image was shown, with Harry holding onto the Golden Snitch in what looks like the scene where he walks to his “death”. If this is indeed an official poster, maybe it signifies that we should be receiving more promotional images soon (a fangirl can only hope!). Pretty sure that poster is fake but that’s awesome about the trailers! I never knew they did the music for them. It looks fake to me. I can’t wait to see what the come up with for the real posters though. Please visit my blog at http://phoenixweasley.wordpress.com. I’ve written a book on Harry Potter that may be of interest to you. You can find out more about the book at http://www.outskirtspress.com/thelordofthehallows.